I started w/ a Fisher from a friend and quickly moved to a Excalibur I. After using this for 10 or more years my wife bought me an Excalibur II. It is a very fine instrument that I love to use. I usually walk 4-10 miles when doing the beach. Love it for private lake and shallow stream swimming areas. Fantastic ground change electronics. Takes a little time to get accustom to but worth the effort. I used the Excalibur I to death. The II is just as good. 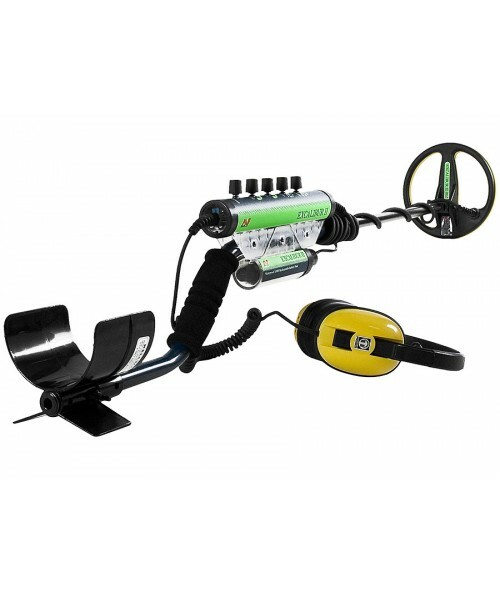 It is a great machine, perfect for the beach and shallow water hunting I do. I do, however, have two complaints. First is the knobs. I was hoping Minelab would rework these in this version. They did not and the knobs are an issue. They stick out and can break easily. They also loosen up and fall off so make sure you keep them tight. The second complaint is trying to get into the battery case. After my battery went dead on my Excalibur I, I replaced it with a setup that allowed you to use replaceable AA batteries. The problem is trying to get the lid off the battery case to change batteries as needed. With all that said it is a great working machine and should give you many many years of fun hunting. The Excalibur machine is a great machine. You will find lots of great things. The only cons I have about the machine are knobs, and Minelab customer service. The knobs if you are not careful will strip off and you have to replace them. As far as customer service, MineLab needs to keep up with demand. I waited about 5 months on my machine, because they were back ordered. The Excalibur is probably the best water machine out there. As soon as I got mine, I found some old silver dollars and about 5 rings. If you purchase this machine, be mindful of the delicate knobs. I received my new Excalibur 1000 and new stainless steel scope from Kellyco, and was excited to be able to use it the following weekend. I found it easy to set the control knobs after reading the booklet that was supplied with the machine. My friend and I who also uses an Excalibur 1000 traveled to a local lake and hunted two swim beaches, which normally get a lot of traffic from other water hunters. Between the two of us, we found two 10K and one 14K rings along with approx. $6 in coins. The discrimination that Minelab offers kept me from digging any nails or iron. Gold has a unique sound that tells you, you have something special. My Garrett 250 has a special sound for coins that I really like, but there is nothing like gold to make your heart race. 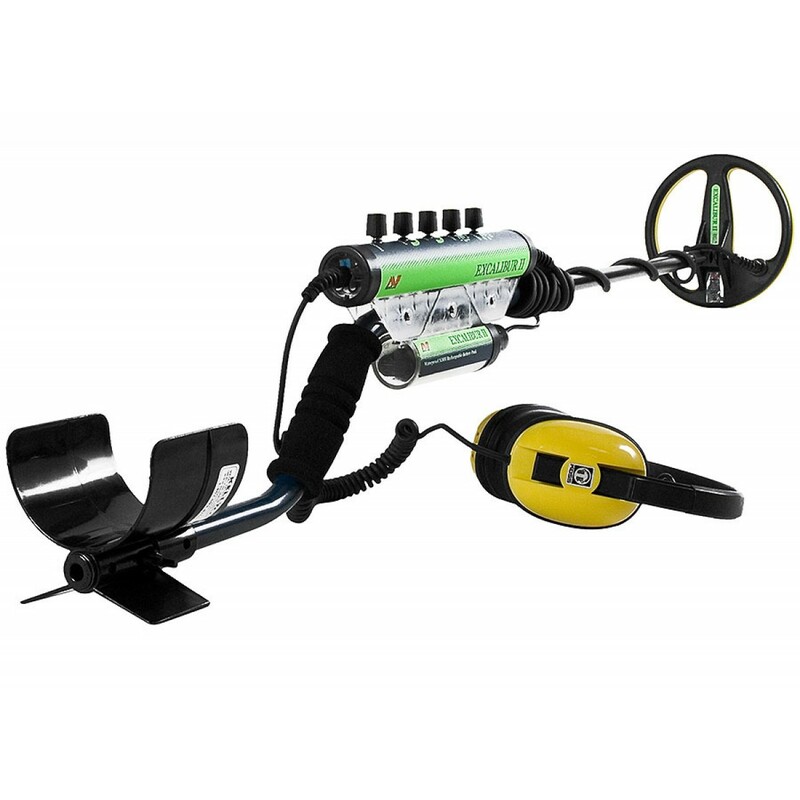 I would recommend the Excalibur 1000 to anyone wants to take their treasure hunting to the next level. I give the Excalibur 5 gold stars! I have owned two Minelab Excaliburs. My first was the Excalibur 800 with the blue headphones. That machine paid for itself the first week of ownership with three gold rings found at state park swimming areas. My second is the Excalibur II 1000. I really love the Excalibur as it is very much like the Sovereign which is an excellent land machine. I love the beaches and the Sovereign, although a great machine, it would be damaged for sure by getting dunked in salt water. So the Excalibur fits the bill for me as far as not having to worry about it getting wet. 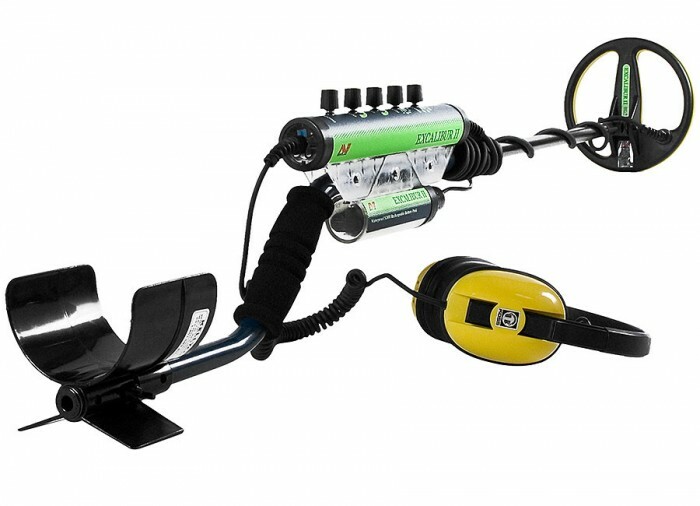 The Excalibur 800 is ideal for water hunting as it swings through the water easily with the small coil. I do recommend getting a straight shaft for the Excalibur as the factory shaft can be uncomfortable for some people. The straight shaft will put the control pod behind you and balance the Excalibur so you can swing it all day without getting tired. Some people prefer the hip mount but you must be careful when hip mounting as the wires have a habit of coming loose. Salt water is a problem for most single frequency detectors and you will get all kinds of noises when hitting the water. Not with the Excalibur. With 17 frequencies, the Excalibur works perfect in almost all conditions. The only time it does not work as well as a PI machine is when in black sand. My detectors are tools to make money and I have been very successful in finding jewelry in the water and wet sand. Coins are fun to find but they do not pay as well as jewelry especially when gold is over $1000 an ounce. My Excalibur 800 was stolen out of my car and so I went and bought the Excalibur II 1000. With the 1000, which has the 10 inch coil, I can cover more area with it than the 800. It is also a bit deeper. But in very trashy areas it has a tendency to null too much because it covers so much area. The Excalibur II seems to be a bit more stable than the older Excaliburs. Not sure if they are deeper but I love the new NIMH batteries. I have been detecting since I was 13 years old. I have used at least 15 different brands of detectors. I use a DFX on land and an Excalibur for the water. I have also used other water detectors. By far, the Excalibur has been the best in the water. In 3 years time, I have found over 300 rings, silver, gold, junk metal, platinum, and seven diamond rings. I have also found coins and numerous amounts of other jewelry. I have used the detector in fresh and salt water and it has worked perfect. There is a slight learning curve but you will have it down in a day. I’m not a tech geek. I’m just an average guy so don’t worry about the learning process. I’m a firefighter and get out when I can. I don’t work for any detector company. I just love the hobby. Maybe some day I will get to England to detect, which is my dream. In case you cant tell, I love my Minelab Excalibur and have never had to repair it once, except for some rubber washers. Thanks and best of luck to all of you. Be safe!